Background: Getrud Scholtz-Klink was the head of the Nazi womenâ€™s organization. 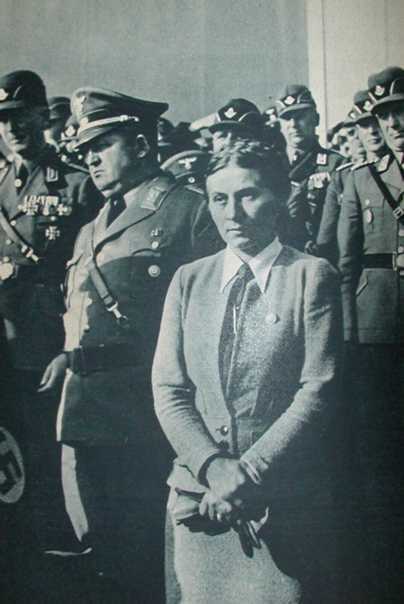 A model Nazi woman, she had six children by her first marriage and a seventh by her third, and remained an unrepentant National Socialist after the war. In this speech delivered at the 1938 Nuremberg rally, she speaks of her groupâ€™s activities and wanders into rather murky philosophy. The source: Tradition heißt nicht Stillstand sondern Verpflichtung. Frauenkundgebung Reichsparteitag Großdeutschland 1938 (Berlin: Deutsche Frauenwerk, 1938). True faith has always demanded the effort and the devotion of the individual. In our day and with our Führer, it demands the most joyful effort and devotion of an entire nation! For the fifth time since the takeover of power, we women gather at the Reich Party Rally — and after only five brief years in German history, our Führer has brought German Austria home, despite all the difficulties we faced. We welcome those women here today no longer as our secret guests, but as our equals. We Germans can thank fate each day that we live in such a great age. Mass meetings like todayâ€™s are simply a collective expression of that thanks. We women especially have every reason to be thankful, since we have been able to follow from year to year the faith and the will that has grown over this period in our work. We had no textbook or example — only our warm hearts and a desire to build a womenâ€™s community worthy of the greatness of the National Socialist worldview. Each year at our mass meeting, alongside all the reports, we have chosen a guiding idea that should set the tone for the answers to the questions that most occupy the hearts and minds of our women in the respective year. Once, we attempted to deal with worries about religions questions. The next year, we showed our women that Bolshevism is the incarnation of evil in the world, calling them to be servants and fighters for the good. Last year, we not only destroyed the myth of oppressed German women, but also proved with convincing evidence that in no other country are women so deeply involved in the internal and external affairs of the nation as they are in Germany. At the same time, we could report that the Deutsche Frauenwerk [German Womenâ€™s Work] had taken on its final form, and that our task in coming years must be to fill completely our women with everything that results from what we have already achieved. Tradition does not mean stagnation, but rather obligation! The Führer has taught the citizens of the German nation that the individual cannot be at the center of events if the state is to be healthy and strong, but rather that the eternal laws of strength and order require bonds to a community. He has further taught us — in contrast to the surrounding world — that such bonds can never be temporary, but rather that they must be firm and unbreakable. Each of us has an unbreakable bond to the community. Each of us has done what she could to help the Führer. We went our way, and do today, with outstretched hands, willing to welcome anyone who wants to go along with us. The obligations of the community are determined by the nature of our community, which believes in the greatness of the German nation. The more we look back on our peopleâ€™s history, the more we realize that only the driving power of this faith has preserved our people up to this day, and that our weakest and most shameful moments have always been those in which there were not enough selfless fighters who believed in Germany. Real faith always sees but one goal, a goal for which no battle can be too hard, no burden too heavy, no path too long, no wait too long, and no love great enough. Aware of the deep justice of our cause, there are two things that cannot be separated from true faith: the daily struggle for the goal, and determined persistence in the various aspects of the struggle. and is satisfied with thinking about “that which is possible” as long as he does not have to do anything— because he is unable to do anything. He is satisfied to be a safe beneficiary standing on the sidelines. The face of our nation in all the twists of fate throughout history, however, has been formed by those who were consumed by faith in the greatness of this people. Fate has always given us people who longed for a great German Reich, who fought for it on the most varied battlefields, and who passed on the burning torch of their faith to succeeding generations. The knowledge that the best over the centuries have fought is surely enough by itself to obligate our generation to do its part to fulfill this ancient faith. How much more, then, are we obligated at a time when fate has given us a Führer who is the living embodiment of the true faith of our age! In the past, true faith has demanded the action and devotion of individuals. In our day under our Führer, it demands the most joyful action and devotion of an entire nation! That brings us to the just demand that fate may make of the community of our nation, since it has given us such a Führer. Through his attitudes, through his teaching, through his revelation, this Führer has brought to life faith and an awareness of the strength of our nation. He therefore has the right to demand the use of that strength. History also teaches us that the faith of many great individual Germans in the past accomplished little because the community in which they lived thought “their goals to be possible,” but were not ready to fight for them. In our most wretched days, we learned to believe in a person and in his idea. Thus, we fought wherever it was necessary, with the complete conviction that true faith demands if its goal is to be achieved. During difficult years, these demands apply to everyone, regardless of class or age. For the first time, we want to build and leave behind us a German Reich that is strong economically, intellectually, and spiritually, a nation in which a confident and proud people may live. It is obvious that the younger generation must be included in this community. It will accept the cause with open hearts. At our last womenâ€™s congress, for example, we gave our youth groups tasks of serving the community, in addition to their paid jobs. A few months later, we made another appeal to the honor of our young girls, calling them to join women working for social welfare and health care. Currently, there is a significant shortage of new women employees in social services, due to the National Socialist stateâ€™s programs in health care and social services, particularly in comparison to the years before 1933. This has naturally had a negative impact on the health of the German people. Overcoming this labor shortage cannot be done at the moment simply by stronger recruitment for the affected professions, for we lack the schools, and the necessary training takes several years of intensive effort. until sufficient trained staff are available to release the lay staff. The work of the Reichsfrauenführung in organizing these women is justified because the Reichsfrauenführung developed the idea, which is only a temporary one. assisting welfare workers and kindergarten teachers. The term in the womenâ€™s labor service is two years. It begins with the first day of work. Assignments are made by the county office of the Deutsche Frauenwerk, labor department. It arranges a contract between the employer and the offices of the womenâ€™s labor service. This contract is not a permanent position under the labor law and Paragraph 11 of the Fürsorgepflichtordnung. free medical care and hospitalization in the case of illness and accidents. Participants in the womenâ€™s labor service, upon completion of their two-year term, receive a grant of RM 1,000 upon marriage. All labor and social benefits applicable to soldiers and men in the labor service apply as appropriate to members of the womenâ€™s labor service. After six months of service, members of the womenâ€™s labor service may apply for training as nurses, social workers, and kindergarten teachers. Up to six months of service in the womenâ€™s labor service can be counted as part of such professional training. Upon entering these occupations, their term in the womenâ€™s labor service ends. Satisfactory completion of a six month period in the girlâ€™s labor service will be counted as a half year of service in social services, upon presentation of the labor service identification document. Just three months after publication of the program, we can announce that as of 1.9.1938, 3,000 girls are active. Two years in the womenâ€™s labor service in social services and health care within the Deutsche Frauenwerk is equivalent to the obligatory year instituted on 15.2.1938 by the president of the Reichsanstalt für Arbeitsvermittlung und Arbeitslosenversicherung for increased involvement of women in agricultural and household service. Companies in the clothing, textile, and tobacco industries may employ single women under 25 who were not employed prior too 1.3.1938 only if they have worked for at least a year in agriculture or household service, and have evidence of this from the Labor Office in their labor book. The same limitation apples to all private and public firms and offices when hiring for commercial or office positions. If In the case of an apprenticeship, the obligatory year can be completed immediately after the apprenticeship is finished. In uncertain cases, the Labor Office in the area of the factory will determine whether the situation falls under the regulations. Its decision is binding for the courts. Through these measures, we want to ensure that each young girl who enters one of these professions has proven that she can serve the community for a year before she can herself make demands of the community. If a people is guided by a worldview that puts its faith in the future on a banner, and this people does all in its power to ensure this future, then the source of its future has every right to protection and help: mothers who have many children. Therefore your daughter, who perhaps is your only one, should learn about this so that she will have a richer and perhaps more honorable life than in the past. In discussing the labor service, I would like briefly to remember the achievements of the last year in the area of assisting neighbors, harvest help, caring for children in NSV camps, and also caring for wives and children of prisoners. This is all done quietly, from the knowledge that our movementâ€™s faith can only achieve its goals if people join in from every side. In our motherhood courses, we have served 1,663,054 participants in 83,381 courses, in 279 mothers’ schools with a total of 3681 teachers. We have 9,064 youth groups with 160,000 girls. Our factory womenâ€™s groups include 30,000 girls. In our home economics department, 1,472,429 women participated in 65,720 courses. There were 127,292 speeches and 5,857 public gatherings (exhibitions, etc.). This area in particular, the relations between the national economy and home economics, is suited like no other to prove that faith in an idea is the most fruitful life force. How many women come to us at first saying: Leave me alone! I don’t understand your ideas at all. I don’t know anything about economics! She has never thought about the fact that, for example, the machine — a physical reality — that gives her husband work and pay did not fall from heaven with directions for using it. Instead, the faith of a person was necessary to make a hundred parts from raw materials. Only then could it provide work and pay. And there was a time when the machine stood silent, and we got unemployment benefits, but the money itself was of no use to us, since it no longer had a health relationship with what the machines that still functioned produced. Once again, it took one manâ€™s idea, and his faith in its realization, to get the machine functioning again and to preserve our lives. Look wherever you wish. All that exists comes from the battle for an idea, which faith makes real. The more people believe, the sooner it becomes real; the more passive, or even negative, they are, the longer before success. Such a battle may last for weeks, months, years, and centuries, even for millennia. Adam and Eve knew that leaves are not only beautiful on trees, but also that they may be used for clothing. It took until our day for us to realize that not only the leaves, but the whole tree is useful, this despite the fact that trees were a physical reality that people could see in front of them for millennia. It took the idea of a person of our age, and his faith in its realization, to show the way to that which has benefited us all. Or take the battle for our daily bread, and in the truest sense of the word. We had an unusually good harvest this year, but we may not forget that it depends on untiring labor from our farmers. Without their labor, all the favorable conditions and all the blessings of heaven are of no value. These efforts depend primarily because German farmers are filled with the will to work as hard as they can to produce as much as possible from the soil, since they do not want to disappoint the Führerâ€™s faith in our ability to depend on our own strength. The path the German Ostmark [Austria] took in returning to the Reich is another example. How long our brothers and sisters had to watch as we lived and worked under the protection of the Führer, while they had to stand to one side. If things had gone the way the apostles of realistic thinking wanted, the Ostmark would never have returned. It was brought home by the Führerâ€™s faith, which was ready to do all when the Führer called! no sacrifice, however hard it may seem to the individual, is too great to be made. Here, too, we must look back in our history if we are to recognize the uniqueness of our age, and if we are to realize its just claim on our full efforts. For centuries, the literature and songs of our people have expressed the longing for a great German Reich, and during the same time hundreds and thousands of the best Germans in distant lands gave their lives for foreign foreign leaders, though these had nothing to do with the longed-for German unity. When things went well for us in the past, we did not always use the opportunities. No, indeed, it was very often the case that during good times that we could have exploited, we sold our bodies abroad and shed the blood of our best on soil we could not till. No one in the past asked about he wisdom of such sacrifices, though historians may have written about the famous trait of the Germans, ready always to be wounded for the sake of foreign interests! Despite the fact that we made countless sacrifices over the centuries that made no contribution to our people or to its unity, fate did not let our people perish. As things took their final and most dangerous course, and as we risked our very existence as a nation for international matters after the revolution of 1918, fate gave us the Führer! Through him we finally realized that, if could not refrain from risking our lives, that at least it should be for our own benefit! If our fate is to sacrifice, then let it be to our own benefit, and to the fulfillment of our historic mission. Today we are making sacrifices. In view of our past, should we not continue proudly, confident in victory? Tradition means obligation. It means not only holding to what is great, but also learning from mistakes! We should keep this side of our peopleâ€™s traditions in mind as well, just as we do the more positive elements that we see alive around us each day. If we do that, we will more quickly find the strength to bear our present sacrifices, carrying them together with the community and thus helping each other. We thank the Führer for showing us the greatness of our past by drawing on the sources of German faith over the centuries. We also thank him for showing us the failures of the past, and for having the courage to lead the way in overcoming them as our best comrade. The sacrifices we as individuals must bring are small in comparison to the great goal of national self-awareness, particularly if we realize that our sacrifices will determine the fate of the generations that will follow. A people can only expect as much good fortune as it is ready to sacrifice for. That is true for peoples as well as individuals. He who wants to be loved must love. He who wants to have a friend must be a friend. He who wants to march with others must be a comrade. Otherwise, he is one of those miserable creatures who wants to harvest without sowing, who want to be loved while turning others away, from whom life has always withheld its blessings, even if that is not always immediately evident. A people, however, that is ready to pay any price of which it is capable for its happiness and prosperity has its own fate in its hands. It approaches life as an honest fighter who wants to be given nothing, but who also will not surrender anything he has gained without a fight! The members of such a people will always know their human limits, and will know that one cannot pick stars from heaven in the same way that one picks apples from a tree. As long as there are stars, however, they remind us that we can never cease our struggles for new knowledge, since we Germans are always attracted by that which is distant and never shrink from difficulties. He who wishes to achieve and preserve anything great in life must understand the eternal laws of this life, which requires the willingness to fight if one is to achieve anything great. This is true in the lives of peoples just as in the lives of individuals. Many human “disappointments” result only because a person ignores these laws. He happily takes something that fate has given him, doing not the least to use this gift, to make it is own. Whether this is an intellectual gift or a person, whether a blessing for a people or for an individual, the same laws always apply. He who ignores them will suffer; he who follows them will be blessed. We obeyed these laws as a people. We want our people to be happy, and we know that we must pay for it with our lives. Because we know this, our community has the foundation of success. The more people who are willing to carry a burden, the lighter it is, and the faster we will reach our goal. Fate itself helps us at the most difficult times by allowing us now and then a look behind the scenes, which we can use to serve our nation. It may be in the racial policy area or economics. As long as we breathe, we will thus continue fighting from our desire to live and from obedience to life. We do this not for ourselves, for we are but an atom in eternity, but for our people for which we must each do our part. The greatest truths have been before us for millennia: the creation with the earth that bears us and the stars that always hold open new possibilities. That has been clear to us for millennia. And we know this from our history: this fills us with awe. But it was the Führer, not a scientist, who taught us to view these laws not only as scientific principles, but to follow them in the everyday life of our people. Final truth has but one home, God himself — but there are two ways we humans can reach it. There is the instinctive path of our soul, and the probing force of our understanding. They have always had two great enemies: the stupidity of rigid irreverence and that dogma which attempts to take the partial knowledge of the moment and make of it binding truth for all times. Faith in the greatness of Germany is the foundation of your future! This faith demands action, for which no sacrifice is too great! With this will, we return to our work. And may God help us to contribute to the glory of German history!